Bead, Swarovski® crystals, hyacinth AB2X, 4mm Xilion bicone (5328). Sold per pkg of 48. Item Number: H20-5760CY Have a question about this item? Alive with color, Swarovski® crystal hyacinth lights up the room with fiery shades of orange. Named for the aurora borealis (northern lights), Swarovski's signature AB effect was created in 1955 during a collaboration with Christian Dior. The effect is achieved by vapor blasting the facets of the lower part of the crystals with an invisible, micro-thin metal sheet. 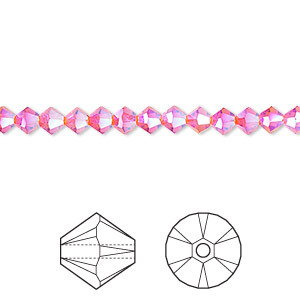 Bead, Swarovski® crystals, hyacinth AB2X, 4mm Xilion bicone (5328). Sold per pkg of 1,440 (10 gross). Bead, Swarovski® crystals, hyacinth AB2X, 4mm Xilion bicone (5328). Sold per pkg of 144 (1 gross).